WASHINGTON – Experts agreed that the Internal Revenue Service's targeting of conservative, pro-life, and evangelical groups in 2012 ties directly back to President Obama's campaign style before his presidency. "The best way to look at this is as a continuum of a very long and determined political strategy that dates back to 2008 and a man named Barack Obama," Kimberley Strassel, a columnist for The Wall Street Journal, declared at The Heritage Foundation on Friday. Strassel argued that "this is a president and his team of political operatives who have always understood the power of speech, but more importantly, the power of denying it to their political opponents." "You go all the way back to the Democratic Primary in the Spring of 2008, and you find Bob Bower filing a complaint with the Federal Election Committee against an organization called the American Leadership Project, which was backing his opponent in the primary, Hilary Clinton," Strassel recalled. She argued that the IRS targeting scandal is only the latest version of this sort of political attack. The Obama campaign also went after a group supporting John Edwards, the WSJ columnist said. Strassel also mentioned Tom Matzzie's 2008 political group, Accountable America, which "was going to start by sending 'warning letters' to 10,000 GOP donors, 'hoping to create a chilling effect that will dry up contributions.'" In 2010, after The Supreme Court ruled for Citizens United and the Democrats failed to pass the Democracy is Strengthened by Casting Light On Spending in Elections (DISCLOSE) Act – the first time – "you have the president in front of the entire nation berating the Supreme Court in his State of the Union Address, talking about the shady money that's going to come out of the fact that they are allowing more free speech," Strassel narrated. She mentioned at least 12 speeches which Obama gave in the 2010 campaign season warning against "shadowy conservative groups," saying "nobody knows who's paying for these ads." When the IRS targeting story broke in May 2013, Democrats pointed out that there was no evidence of a telephone call where Obama directed the targeting, Strassel noted. But "he didn't need a telephone, he had a megaphone," and the WSJ reporter said the IRS was listening. While Obama explained that the officials were merely "confused" about regulations that date back to the 1950s, Strassel pointed out "that the IRS officials were hyper aware of the political environment." She referenced an email from a Cincinnati screener which read "recent media attention to this type of organization indicates to me that this is a high profile case." Strassel explained that Obama's key strategy is to attack the groups supporting his political opponents by questioning the legality of their business practices. In the 2012 IRS targeting case, Obama's public attacks against "shadowy right wing groups" led the IRS to investigate conservative nonprofit groups more closely, resulting in a political disadvantage for Obama's political rivals. "He didn't need a telephone, he had a megaphone," she quipped. 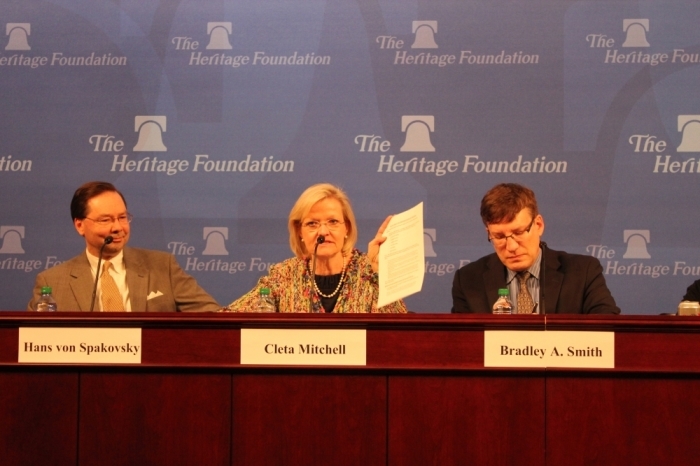 Other panelists at the Heritage event Friday emphasized that the IRS scandal is far from over, arguing that new regulations may lead to further audits for groups targeted in 2012. "All those who finally got tax exempt status last year, now they're in danger," warned Cleta Mitchell, partner at Foley and Lardner law firm. Mitchell argued that the new rules were sneakily submitted in November, just before Thanksgiving, so people would be less likely to comment during the appointed time. Bradley A. Smith, chairman and founder of the Center for Competitive Politics, argued that the new rules constitute "an effort to regulate campaign finance disguised as a tax regulation." He explained that when the DISCLOSE Act failed last summer, Democrats turned to the tax code to force their campaign finance reform. While such reform normally falls under the bipartisan Federal Elections Commission, Smith alleged that Democrats decided to push the rules through the Obama administration's IRS as a way to circumvent Republicans. He also explained that since the IRS has no experience in drafting these kinds of regulations, they will be less effective and will end up causing a great deal of problems for nonprofit groups on both sides of the aisle. 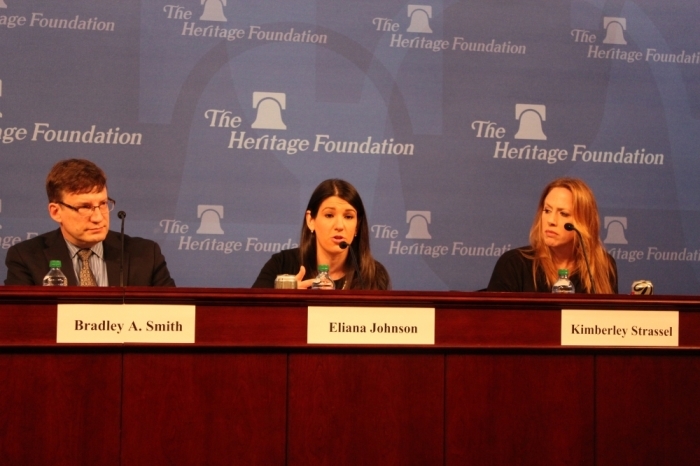 "The Republicans have an enormous advantage in 501c4 giving," explained Eliana Johnson, media editor of National Review. Johnson argued that the impact of these regulations would fall on Republican groups more than Democratic groups, and claimed that a friendship with Democrats might lie behind the new rules. "Top IRS officials have been very useful to the Democrats and the Democrats have been very useful to top IRS officials," she said. Johnson explained that even groups that typically support Democrats such as the Service Employees International Union and the American Civil Liberties Union oppose the new IRS regulations, while Democratic politicians "who want to shut down 501c4 groups on the right" support them. Each of the other panelists agreed with Strassel's argument about Obama's strategy and her outline of the cases where the president has weakened his political opponents by drawing attention to their business practices. Strassel quoted the House Ways and Means Committee's report about the new IRS rules, saying the committee "has noted it looks very much to them as though this rule was reverse engineered" to attack the same groups the IRS targeted in 2012. "Somebody took a look at all of the organizations that had been targeted prior by the IRS and then drafted these rules to make sure that they could encompass those groups again, but in a formalized fashion."